Switch out a dark kitchen for a bright and welcoming one with these illuminating ideas. Q: My kitchen doesn’t get much natural light. 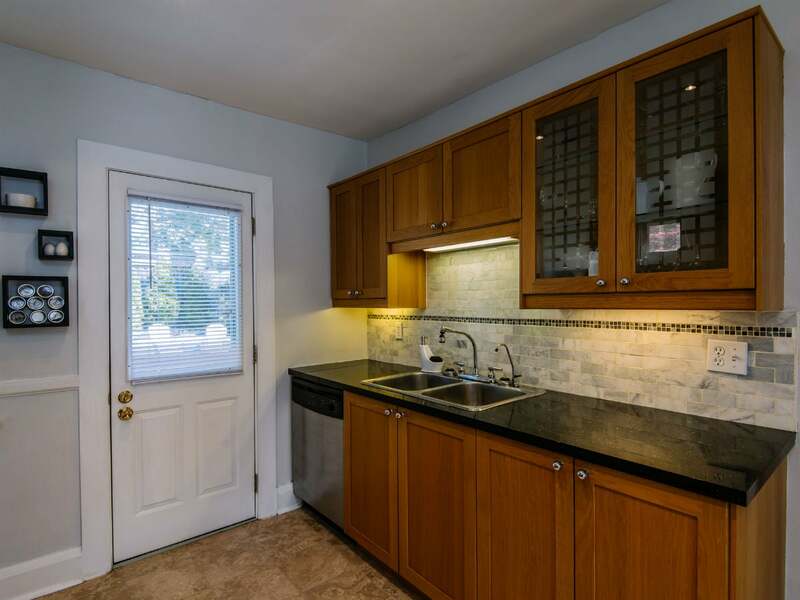 What kitchen lighting design would you recommend? A: A well-lit kitchen is a must given the room’s many uses as a social space and transit zone, food prep and cooking hub, and display area for decor. But beyond improving the overall visibility of the space, proper lighting makes it quicker and easier to stow or retrieve items in cabinets high or low, allows you to slice and dice with greater safety and precision, and can even make a space-starved kitchen look and feel larger. 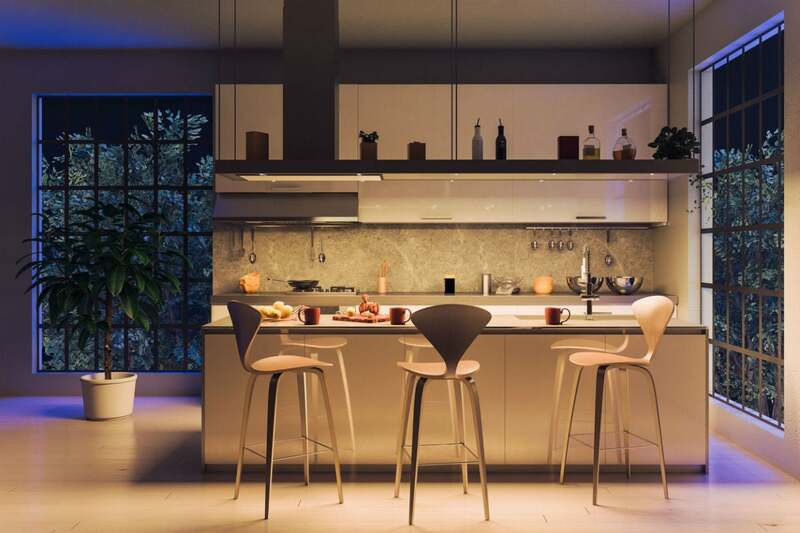 While many homeowners cite a lack of natural light as the culprit behind their dim kitchen, artificial lighting of the wrong type or in the wrong location can add to the problem. When revamping lighting design, it’s smart to consider everything from function and fixture to the type of light bulbs you use. Ahead, solutions to common kitchen lighting challenges to ensure optimal illumination for all your needs. Base your kitchen lighting design on three layers of lighting. Ambient lighting is soft overhead light that illuminates the floor and walls so you can easily enter, exit, and navigate the kitchen. 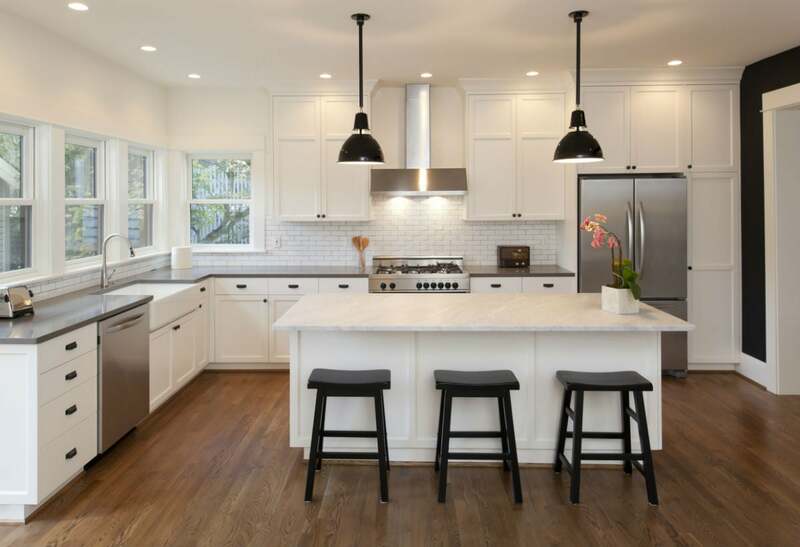 Task lighting is brighter to illuminate countertops, islands, sinks, and other work areas for increased precision during food prep, cooking, and cleaning. Accent lighting, in between ambient and task lighting in brightness, highlights architectural features or decor in the kitchen, such as a coffered ceiling or a collection of fine china. A layered approach incorporating all three types brings the right level of lighting for the various uses of a kitchen. It also helps minimize shadows, which often result from the exclusive use of overhead lighting, and glare, which can stem from only using bright task lighting. Buy light fixtures suited for each layer. 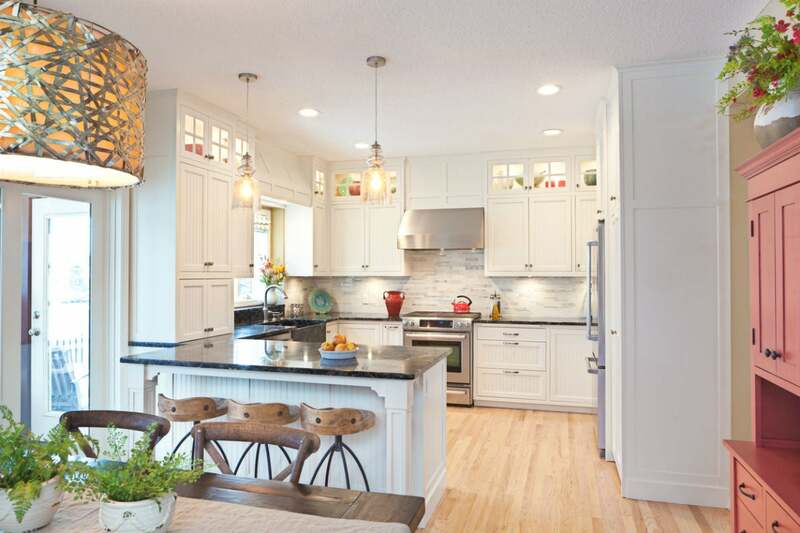 Ambient light fixtures in the kitchen include recessed lights mounted inside shallow openings in the ceiling, flush-mount or semi-flush-mount fixtures that affix to the ceiling with a small or large gap between the fixture and ceiling, respectively, and chandeliers or lanterns that hang from the ceiling by a chain. Accent light fixtures include cove lights that are built into the ceiling and puck lights—round, low-profile lights that mount on or inside cabinets. Position fixtures based on function and type. When installing a single semi-flush-mount or flush-mount fixture, chandelier, or lantern, position it directly above the island, or at the center of the ceiling if you don’t have an island. When installing recessed lights, leave a distance between the lights equaling half the height of the ceiling (e.g., space lights five feet apart in a kitchen with a 10-foot ceiling). To avoid casting shadows on countertops, try to position recessed lights above countertops so they are set a few inches back from the front edge of the countertops. Pendant lights are ideally placed directly above sinks, standalone chopping stations, dining tables, and other hubs of activity. But you also want to avoid placing them directly above appliances with their own built-in lighting, such as stove ranges or refrigerators. To minimize glare while you work, mount so that the pendant is no closer than two-and-a-half feet from the surface it’s lighting. LED strips or tape should be placed on the underside of upper cabinets to cast a spotlight on food and drinks on countertops. Placing them inside drawers, behind cabinet or pantry doors, or on the underside of base cabinets can also afford easier storage and retrieval of utensils, food, pots and pans, or cleaning supplies kept inside. 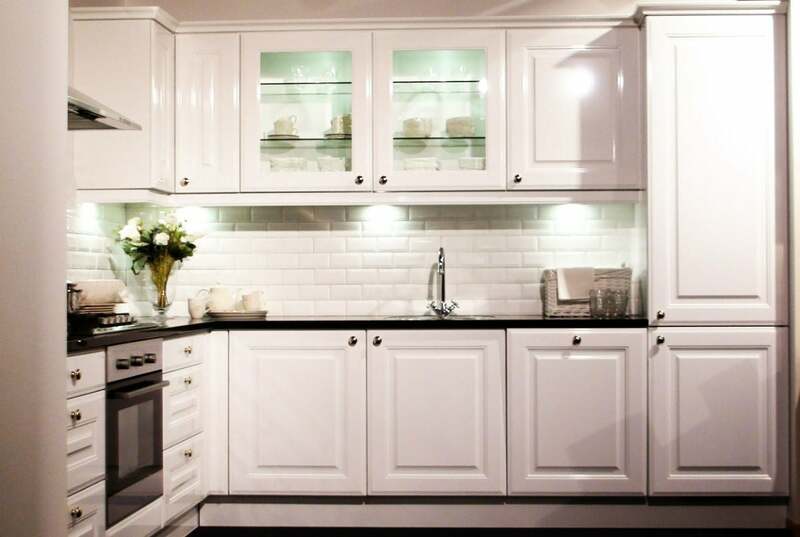 Mount these lights one to three inches from the front of the cabinet to reduce glare. Install cove lights in the ledges of a ceiling to play up decorative ceiling tiles. Place puck lights on the underside of upper cabinets to showcase vases or other countertop decor, or on the roof of a cabinet shelf, one to two inches from the back of the shelf, to elegantly backlight tea sets and other showpieces. Use light housings to diffuse light over glossy kitchen surfaces. Certain LED light fixtures, such as LED strips, cast a beam of light onto a surface that is brightest and most concentrated at the center of the beam and less bright on the edges. This is suitable to countertops made of butcher block, stone, or another material with a flat or matte finish. But with marble, granite, or similarly glossy materials, the center of the beam can produce a distracting glare even when placed a few feet away from it. To avoid this, place LED light strips inside light housings (available from brands like Litever on Amazon), which are aluminum channels with frosted covers that help diffuse bright light and minimize glare on shiny kitchen surfaces. Choose bulbs that emit ideal color temperature. Ambient and task light fixtures: Opt for bulbs with a color temperature of 3500K to 4100K to ensure that floors and work surfaces are lit with a neutral, true white light. Accent light fixtures: Choose a temperature of 2700K to 3000K to backlight showpieces with warmer light, or a temperature of 3500K to 4100K to cast sharper white light on muted architectural details or decor you want to play up. A small window set in the middle of a backsplash. Tall and narrow windows placed in a gap on the wall between upper cabinets. Clerestory windows, which are short and wide windows that sit above the eye level, usually located along the top of a wall. Porthole windows, which are small, round windows placed high on a wall. Adding a pane of glass to a door.